My little pirate and ballerina out for the "goods". I don't feel the need to be acquiring quilt magazines and books like I used to. But. Sometimes books come along that you welcome into your sewing spot. Even if the girls that wrote these books weren't my friends, I would definitely buy these 2 books above. They are both full of great content and will be used over and over by me. 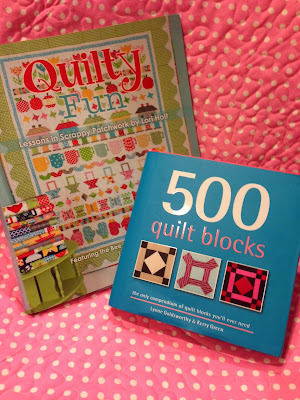 My good friend Lori Holt's book Quilty Fun is full of new ideas for her row by row blocks quilt. I'm going to be participating in a blog hop soon with Lori's book so watch for that. More info next week. Lynne Goldsworthy and Kerry Green are amazing British quilters and authors of 500 Quilt Blocks. Love how they pack so much great stuff into a little book. All 3 authors have amazing blogs. That is how I met all of them. My sisters and nieces and I are making apples in 2014 for an apple quilt or table runner. Each of us are using the basic block idea from Lori's book to make a custom project. I'll also be making baskets. What fun! 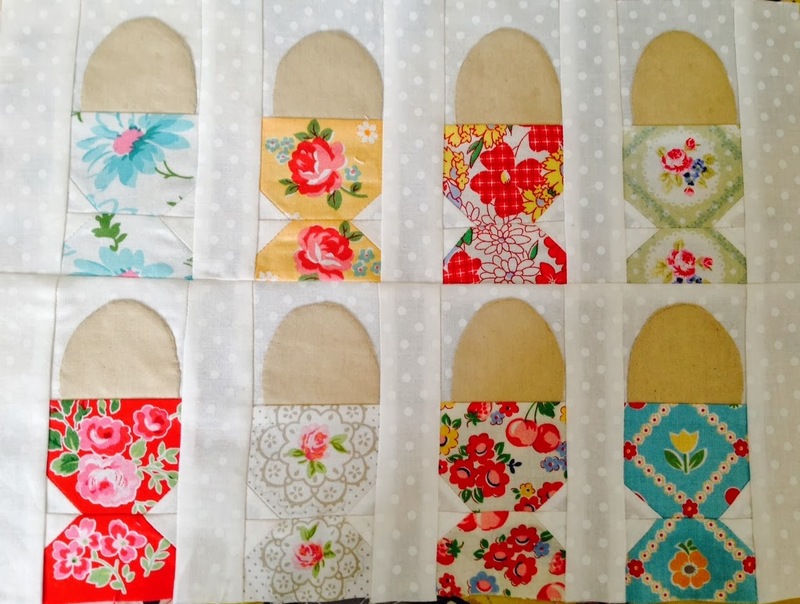 I used bits of PKM Picnic to make a few blocks over the weekend (I seriously don't want to cut my fat eights!). I used a block pattern from Lynne and Kerry's book. 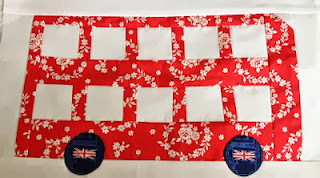 I am making a baby quilt with the new fabric and loving their easy instructions. 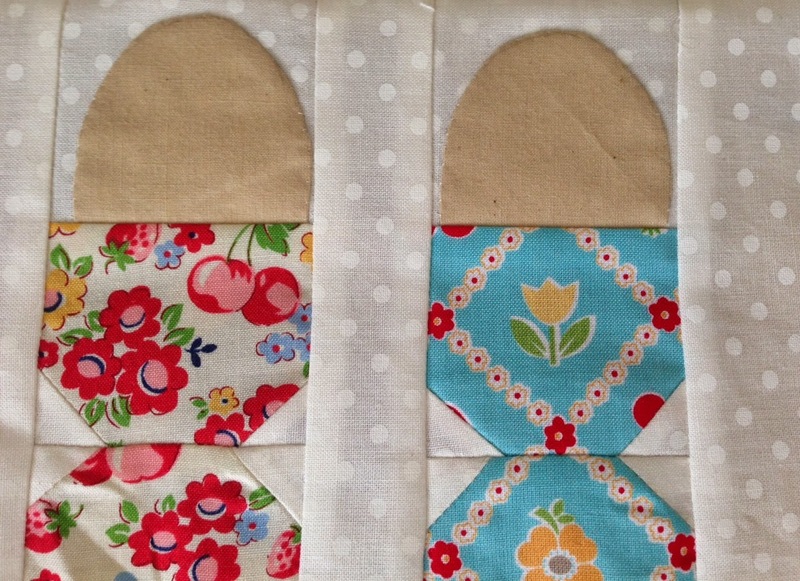 I'm excited to see how a simple block teamed with great fabric creates a powerful design. So it is Fall Quilt Market in Houston this week people. Quilt Market is always a big highlight for those of us that love fabric and quilt making. No. I won't be attending (it's ok, too busy anyway) but I always like to peek at tweets, blog posts, and Instagram photos to see what is happening. 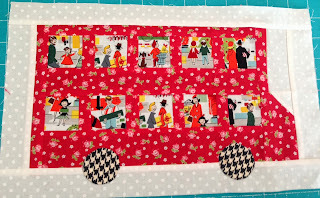 Fat Quarter Shop always has great tweets and photos (@fatquartershop). 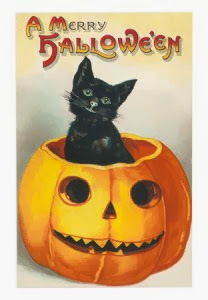 If you haven't heard Pam Kitty Morning has a new fabric line coming out with Holly of Lakehouse. It is called Pam Kitty Picnic. And it is swoonable. I believe it ships to a quilt store near you next month. So get ready to dive in. 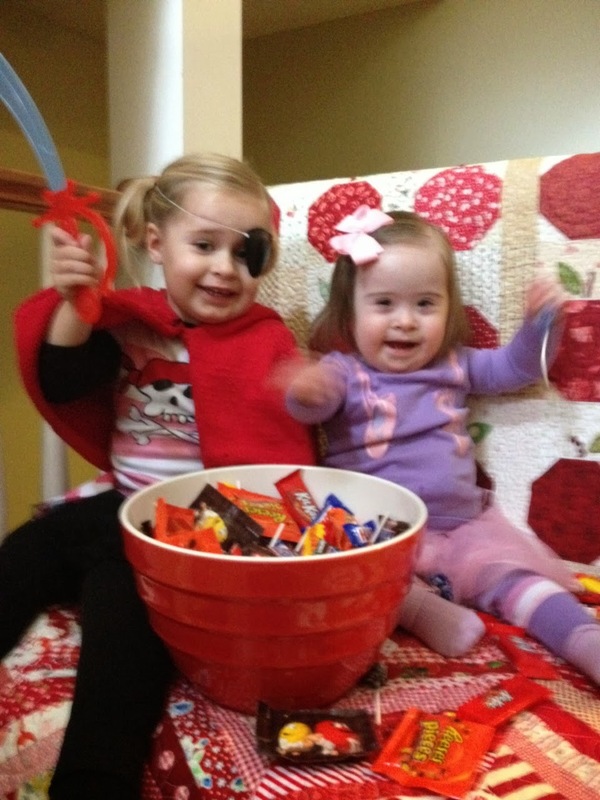 Pam and Holly always have a wonderful selection of colors and patterns. I'm a lover of roses in fabrics, of course. Look at the variation in color. All happy, right? They've taken the dots and grown them since the last line. And also some of the roses have grown and flourished. Look at the new buttery yellow that is added this time. Delicious. Pam and Holly kept some existing prints and added some brand new touches. The cherries are darling. That navy and red is spectacular. These are basics from the PKPicnic line that are like "must haves". I can see binding in the gingham and dots, too. The panel is my favorite panel from all the PKM lines. The little squirrels and the doggies are just like from greeting cards of the past. They remind me of cute, simple times. Adorable. I really can't get enough gingham. You saw the bigger cherries, now these are the tone on tone cherries. Tone on tone plays like a plain but with sass (just like PKM). I think these above are some of my favorites. I do love the texts with the little illustrations. Super super cute. And the colors in the flowers above are really eye catching. I can't wait to use them all. More of my favorites. I love the new colors. I love the little doggies and the sweetness of these fabrics. Pam and Holly knocked it out of the park yet again. How can each line become my favorite all over again? Well they do. Thanks so much for the fabric Pam. I will be thinking of you and Holly at Quilt Market. Good shoes. Good shoes. It is a tough few days but so fun to see everyone and strut your new stuff. I love PKM. She is simply the best. Now to Marcy at Made By Me in Red. Go visit. Go. Then come back. 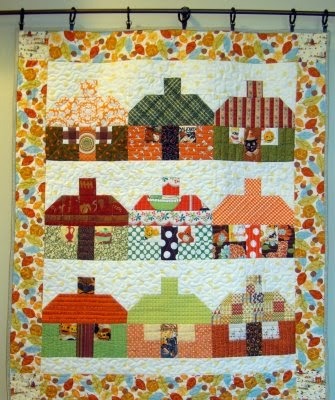 Marcy bought PKM fabric and used my Row by Row pattern to create her very own Row quilt. I'm so flattered. Marcy did an amazing job. I can't stop looking at it and smiling. Great job Marcy. Love it. Thanks for sharing it with us. I love your photos of the quilt. My London 2013 really is coming along too slowly to suit me but I have to accept the pace I'm at these days. Slow and steady goes with my daily life. 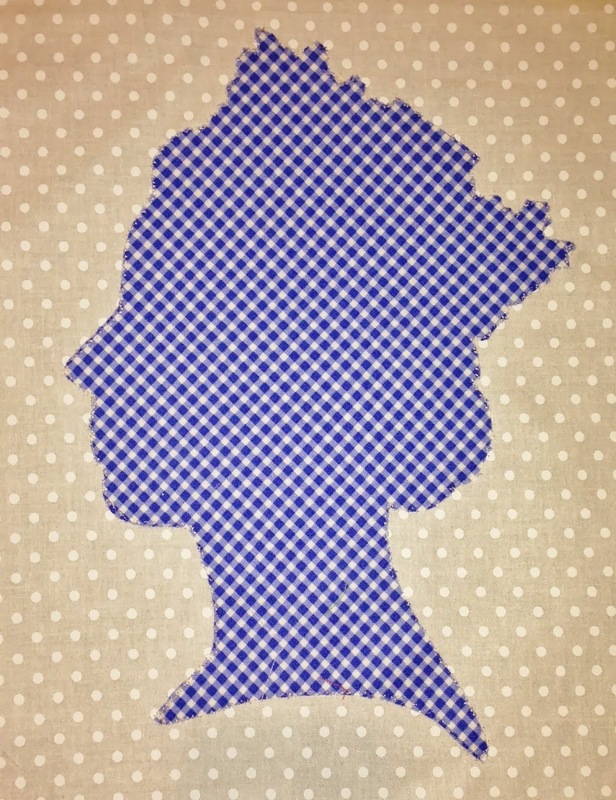 I don't often work with fusible applique and I mostly I hand stitch my applique blocks but this crown would be excruciating to hand applique I think. I'm really not good with the invisible polyester thread but it is a big improvement from the old stiff nylon thread I used years ago for machine applique. This Superior brand thread worked pretty well but my tension was too tight. Don't look closely. Please. However, I think the queen looks mostly pretty grand. 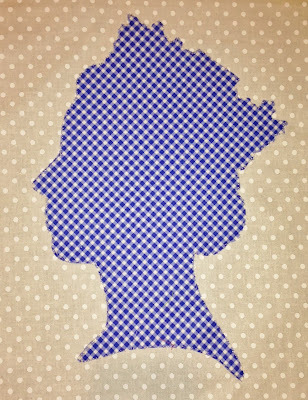 The PKM blue gingham is perfect for her majesty. Not much progress on London 2012. But just a little. I Big Ben is finished. Fun and easy. I'm working on making a little castle. Maybe. I don't know if it will transfer into the pattern. But enjoyable to be creative with it. What would a London quilt be without the vintage egg cup? I think the shape is just so pleasing. 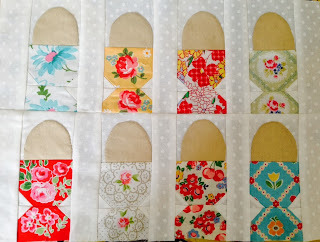 It was just so much fun to look through my fabric and pick some cute fabrics for my egg cup collection. The cups are block construction and the eggs are applique. They went together really fast. I am happy with my little egg cups. I would never have time to set my table with real egg cups for breakfast but it is fun to make pretend on fabric.